PhytoChemia's Blog: License for analysis medical marijuana/cannabis for Canadian producers - License delivered by Health Canada. License for analysis medical marijuana/cannabis for Canadian producers - License delivered by Health Canada. 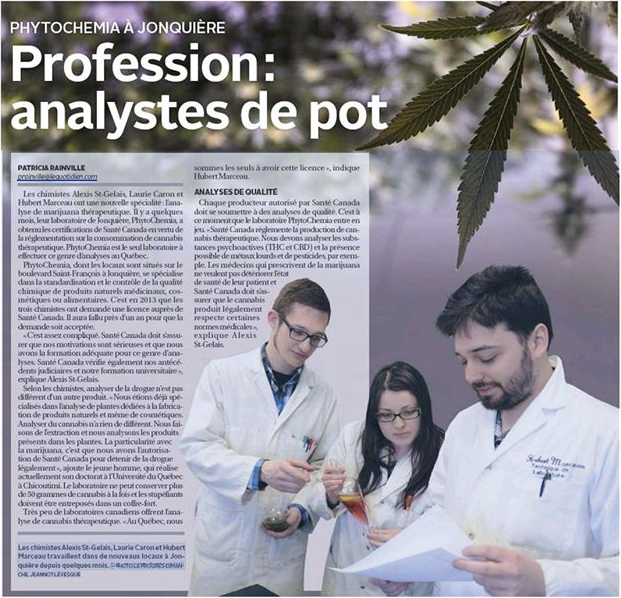 Recently, Laboratoire PhytoChemia has received its license for the analysis of medical cannabis from Health Canada. We offer to producers scientific consulting and third party analytical services. We offer HPLC and GC determination for cannabinoids (THC/CBD and their acidic form), quantification of heavy metals, pesticides, bacterial count and volatile terpenes profiling in our standard analytical package. Although the medical cannabis is regulated under the Marihuana for Medical Purposes Regulations (MMPR), the raw material of cannabis is treated in exactly the same way as medicinal plants or other natural products based plant. Tetrahydrocannabinnol (THC) and cannabidiol (CBD) are the most known compound in cannabis, they also are among the most studied. There are currently about 104 compounds in cannabis and most of them, have only been reported once in scientific literature and there are no official data on their effects on the human body. Recently, new data have been reported on some cannabinoids like cannabinnol (CBN), cannabigerol (CBG) and cannabivarin (CBV) and it seems that most of them have an effect on the body. With these new researches published and popularization of the data it may be interesting for consumer to know more about the product that they use. Two strains with similar THC/CBD ratio may not have the same effect on a user and the difference may be in the minors compound. As for the volatile terpenes, these are responsible for the flavor and odor of cannabis. This is a field that is very studied, especially in perfumery and flavor chemistry, but is lacking in the cannabis industry. Users are able to discriminate the taste in different strains but these are not quantified. By building a database of the volatile compounds and their relative concentration with the organoleptic properties (taste, smell, etc. ), producers will be able to develop a better marketing around their products and the consumers will be able to choose a corresponding product for their needs. HPLC will have the advantage of being soft on the material, therefore it will degrade less the active compounds. You will be able to have an accurate determination of every cannabinoids that you wish, providing that you are able to separating and identifying them. Generally this imply a standards, so you will need to have a sample of a pure compound. In the case of THC, you will be able to determine the concentration by measuring THC and THC acid and adding them up. This is taking for granted that most THC in the plant is under these two forms (a fact that may not be true since there is two forms of THC acid (A and B) and recently there have been 8 terpenic esters of THC found). It is reasonable to expect that some THC is still bound in unknown way in the plant. A big plus of determining THC and THCa separately is that THC is virtually absent in fresh plant, so a high ratio of THC vs THCa may indicate that the sample is starting to degrade. GC on the other hand, imply the pyrolysis of the THCa (and possibly some of the ester too) to THC and measuring only the THC. This method has the advantage of being very simple and easy to implement but doesn't give us indication if the material is degraded or not. This method also take for granted that all THCa (or THC ester) in the plant decompose to THC in the GC injector, which may or may not be true. All these method also take for granted that the extraction method extract all the THC compound, it is our opinion in recent view of the current litterature that this may not be the case. The discovery of a series of terpenic THC ester in 2008 seems to indicate that the compounds bound to other moeity in the plant, therefore it is reasonable to expect that THC may bound to other compounds that may not be extracted by the current solvent method, like cell walls or sugars. A strict quality control from producer on his production will allow to prevent many problems such as potential contamination in the process and they will be able to have consistent data and do good statistics. These statistics allow the producer to make discoveries, to optimize their production and to offer a more fit diversity of product to their customers. Consequently, the consumers will be certain to have a product of good quality with safe properties. (1) Pertwee, R. G. Handbook of Cannabis; Oxford. ; Institute of Medical Sciences University of Aberdeen, UK, 2014; p. 781. This is a field that is very studied, especially in perfumery and flavor chemistry, but is lacking in the cannabis industry.